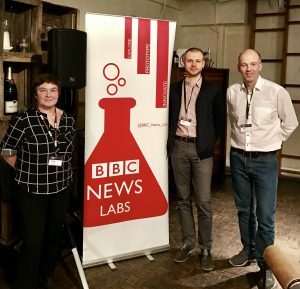 Several SUMMA team members attended the BBC News Labs Hackaton on text-to-speech technologies (#newsHACK – Transcriptor) in London on 31 January and 1 February 2017. As shown in the picture below, the SUMMA team comprised of two members of user partner Deutsche Welle, i.e. Andy Giefer and Peggy van der Kreeft, and Renars Liepins from LETA, the Latvian News Agency, the platform integrator. SUMMA ASR specialist Peter Bell also took part in the event, representing a speech processing team from the University of Edinburgh. The SUMMA team worked on and presented an editorial component for adding corrections after different steps in the process, in particular between ASR and Machine Translation. This is all the more important as most current ASR systems do not include punctuation, and that is essential to provide a good basis before moving to automated translation. 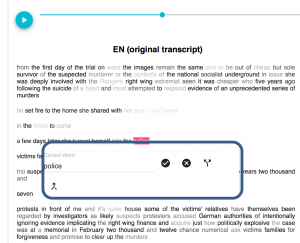 The team made progress in this area and developed a module to insert punctuation, split or combine sentences and to correct the wording of the ASR output. The event was a great opportunity to meet other organizations and groups working on different speech technology-related aspects. Several speech recognition and automated speech production systems were shown, including automated voiceover or voice-enabling for mobile devices. Teams came from different regions of Europe, and even beyond, and broadcasters such as DW, BBC, and VRT, as well as commercial technology providers.